The trend these days is to combine multiple fabrics together to create jackets which offer zones that have specific functions. The Marmot ROM (stands for Range of Motion) Jacket is no exception to this new design paradigm and is one of the first medium weight softshell that we know of to take advantage of this zonal design approach. 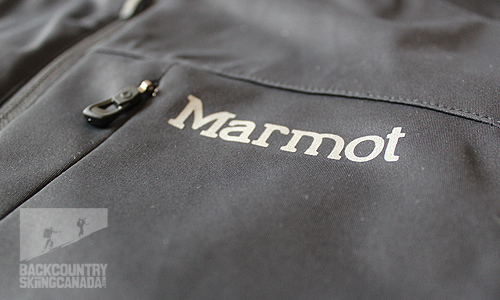 The Marmot ROM provides insulation, stretch, breathability and is windproof and water resistant. This 'swiss army knife' of softshell jackets, allows you to potentially wear a single jacket on the up and the down. This all sounds good in theory but does it actually perform in the field? The Marmot ROM Jacket is made of Gore Windstopper softshell 100% polyester fabric which is windproof and breathable while also being water resistant. 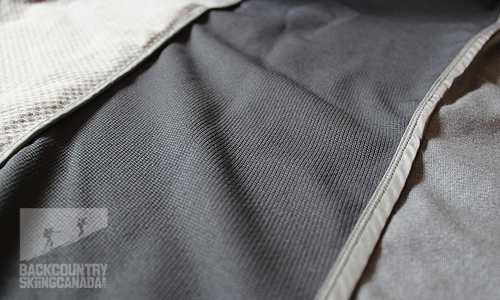 The fabric provides generous stretch and some abrasion resistance while still being quite soft. It provides insulation while also being breathable and limits overheating and perspiration build-up by allowing moisture vapour to escape. The zonal construction divides this jacket into three regions: chest, side panels and the rest of the jacket. 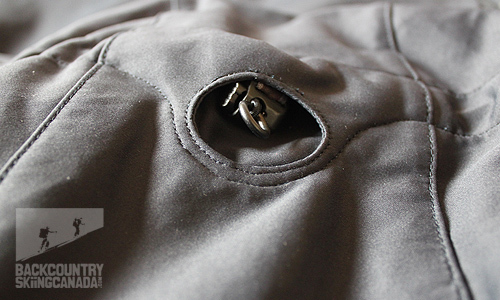 The chest region offers the most warmth thanks to the quick-drying polyester fleece on the inside (due to the need to accommodate the front pocket locations). Under the arms, the side panels are very thin and allow for maximum venting where you need it most when you are puffing your way up the skin track. 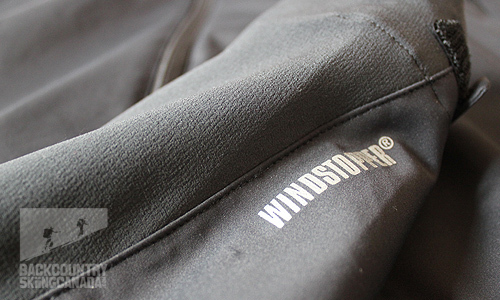 The remainder of the jacket is the middle ground, Windstopper polyester. Put them together and you have a great combination of fabrics to cater to the different regions of your body. Top this all of with a durable water repellent finish (DWR) which offers additional weather protection from light rains. Initially I thought the Marmot ROM Jacket looked too long for me but once I gave it a chance I realized why this was so. The extra long cut keeps your mid section covered and warm if you are skiing (and possibly falling) or climbing with your hands high and over your head. 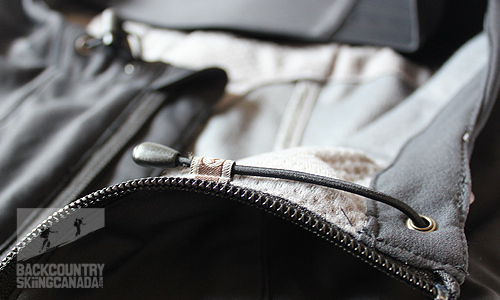 The ROM jacket stays put, keeping you warm. I like that. I am 6'1" and 170lbs and I found the large size to fit perfect in the arms which can sometimes be a bit of a challenge. The polyester material has quite a bit of stretch for skiing and skinning and overall I found the Marmot ROM Jacket to fit well and be super comfortable. Velcro cuffs: Keeps heat in and snow out. Pockets: Chimney Vent pockets (translation = deep) can hold a single climbing skin each to keep them warm and dry on the down. Hood: Fits ski and climbing helmets and has two ergonomic hood adjustments to get the fit just right. 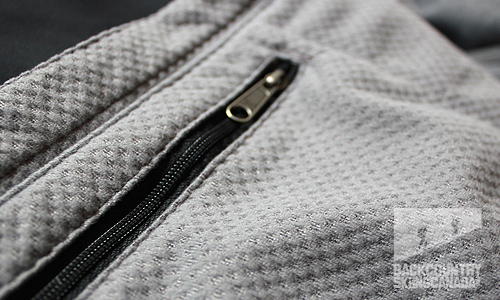 External chest pocket: Utilizes a concealed zippered and is large enough for a snack or sunglasses. 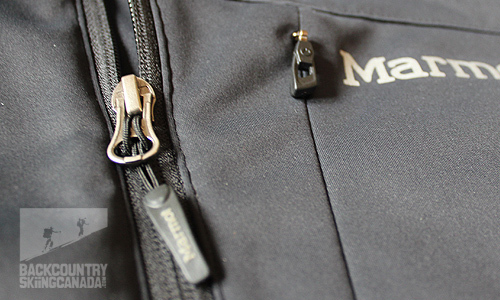 Internal pocket: Large enough storage for small camera or to keep your wallet safe. 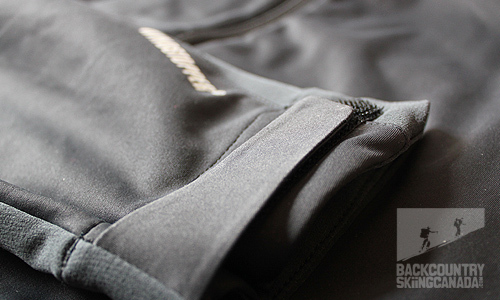 Other goodies: reflective logos, elastic drawcord hem, 'Angel-Wing Movement' for enhanced range of motion. The earlier claim of the 'swiss army knife of jackets' is not far from the truth however no one jacket can truly do it all as there are too many variable in the mix. Weather, physical exertion and personal preference all come into play. During our testing we found this to be a good softshell for most days when it was not too cold. When it was to cold it became a good insulating mid layer under a proven hardshell and in extreme conditions a down jacket. 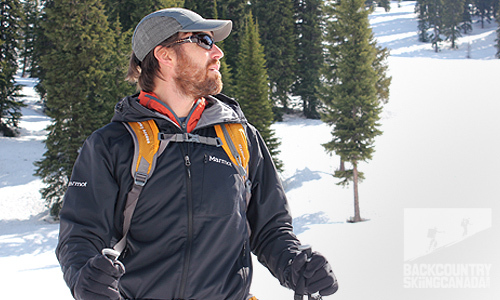 Like any softshell jacket the Marmot ROM Jacket is suited for active pursuits and not static warmth. 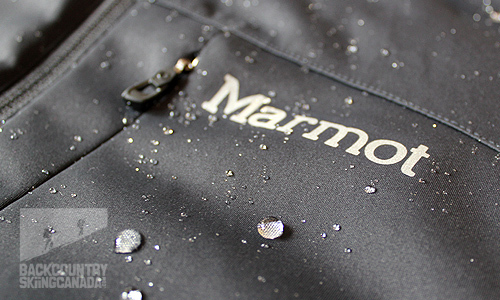 As for precipitation, it beads nicely on the Marmot ROM, thought it's worth keeping in mind that even though most softshells claim to be water repellent it is simply a DWR coating that ultimately wears off (typically on the shoulders and back due to pack rubbing) and need to be reapplied over the life of the jacket. Overall if comparing softshells apples for apples the ROM definitely has more to offer than traditional single fabric jackets. 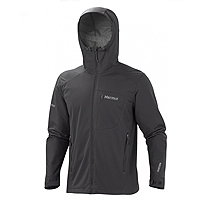 Combine this with the hood and the Marmot ROM Jacket truly offers many options for the backcountry skier. Zonal Construction, included hood, priced right. Would be nice to be able to stow the hood away when not in use. 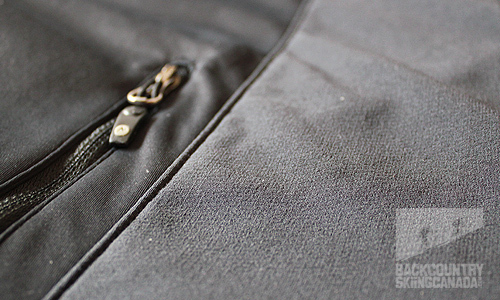 Pockets can get in the way of pack straps when you are wearing a pack.